This year, 2017, is the Year of the Rooster on the Chinese Calendar. Since 2005 Grade 6 students have been making a group mosaic which is presented to the Principal at the Grade 6 Graduation in December. Since we have completed mosaics for all twelve of the animal characters we need to decide what this year’s topic will be. The Year of the Monkey ( 2016) mosaic was designed by a group of Grade 6 students who submitted designs. Emily, Jasmine, Liana,Vlad and Aliyah all contributed ideas to the final design. Many students helped to cement on the tiles which they cut, using side nippers and, of course, wearing safety goggles.The monkey’s ears were made using mug handles.The twelfth in our Chinese Calendar series, this mosaic is displayed along with the eleven other animal mosaics along a wall in our school courtyard. 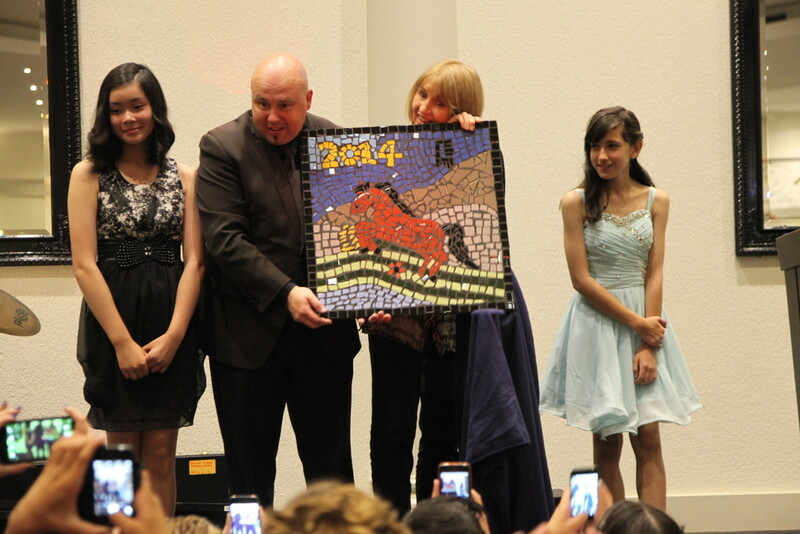 The Year of the Horse Mosaic for 2014 was designed by Tahlia Akurt. Congratulations Tahlia ( pictured on the right). Also presenting the Mosaic to our Principal, Mr Chris Sevior, on December 18th was Pesiny (left) who added the Chinese symbol for horse to the top right of the mosaic. 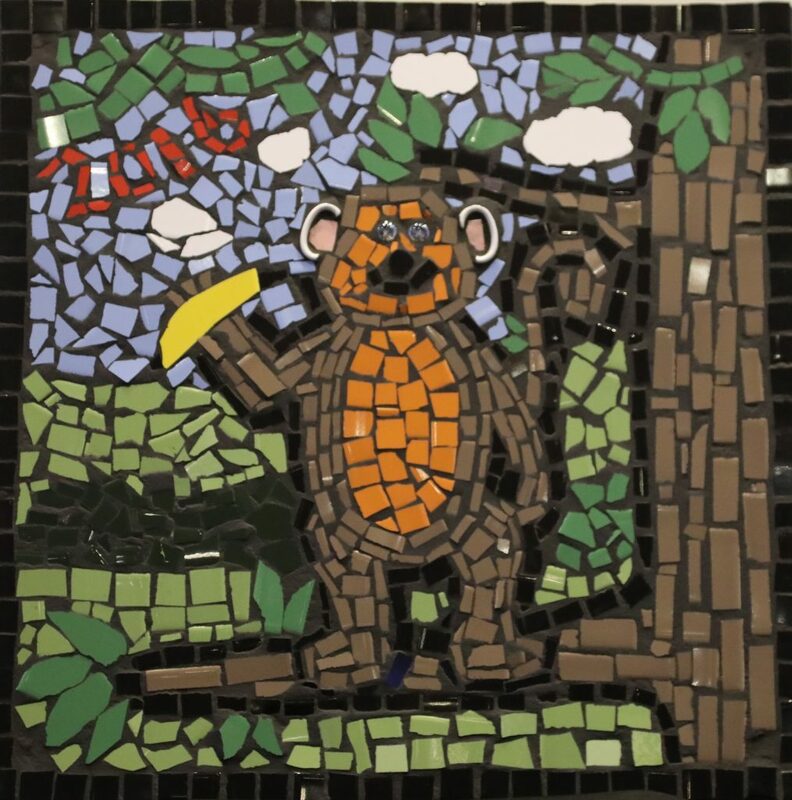 In 2013, Grade 6 students Sasini and Jamie-Rose provided the design for the mosaic and all the Grade 6 students helped cut and cement on the ceramic tiles to form the picture. 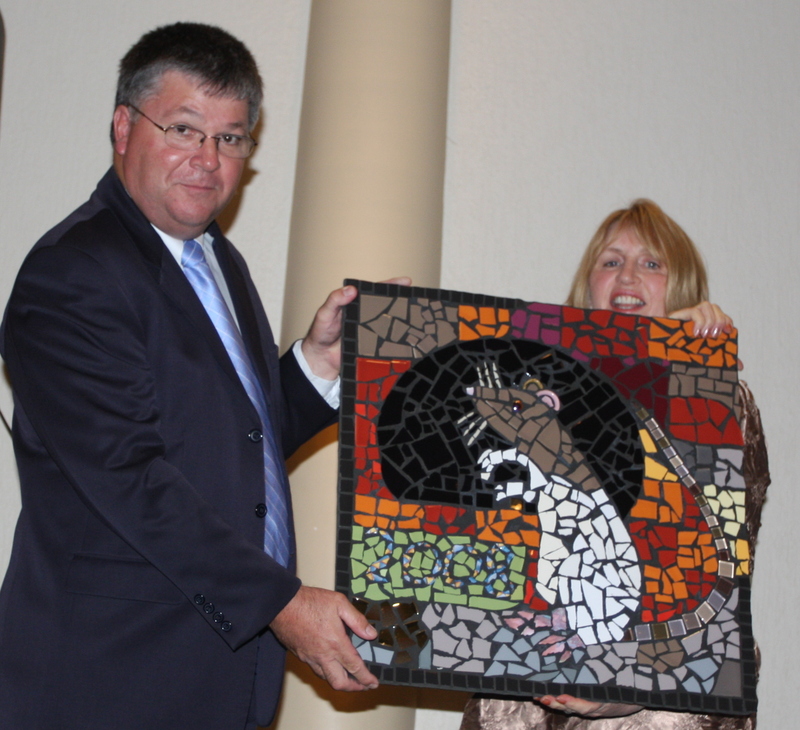 The completed mosaic was presented to our Principal, Mr. Chris Sevior at their Graduation ceremony on December 19th. In 2012 the Year of the Dragon Mosaic was designed by Caitlyn of 6JS. Congratulations Caitlyn. 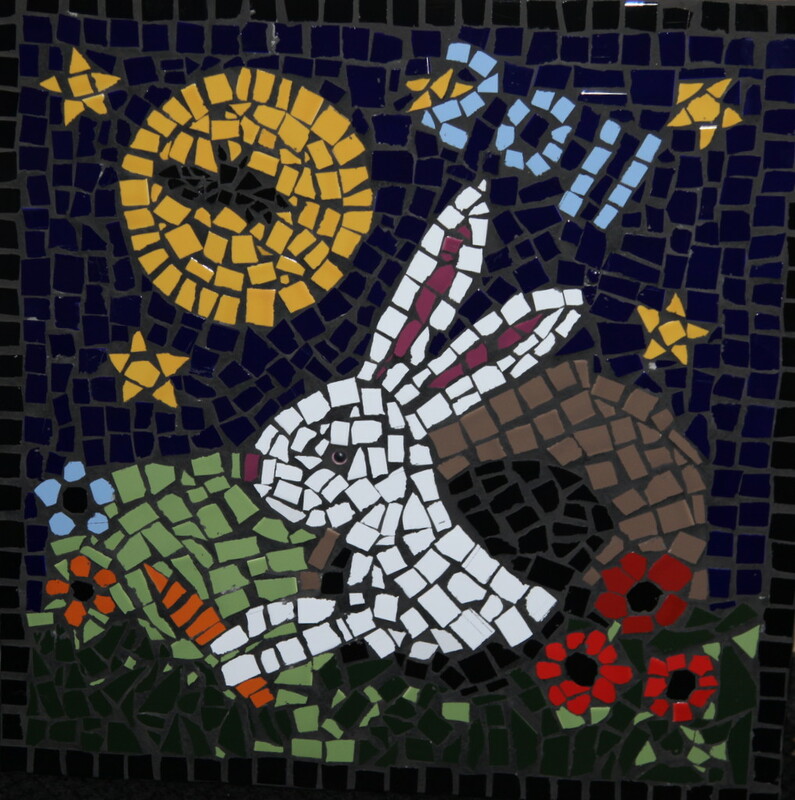 In 2011 The Year of the Rabbit Mosaic was jointly designed by two grade six students, Nethmi and Sukhjit. December 18TH 2010 – Last night’s Grade 6 Graduation was held at Luxor Receptions in Sydenham. At the end of the evening, as is tradition, the Principal, Mr Chris Sevior, was presented with a Mosaic depicting the animal featured this year on the Chinese Calendar. Erika’s design was chosen and made as a group effort by Grade 6 students. Congratulations go to Erika (pictured) and to all the students who contributed. The work will soon join the five previous year’s mosaics on the wall in our school courtyard. 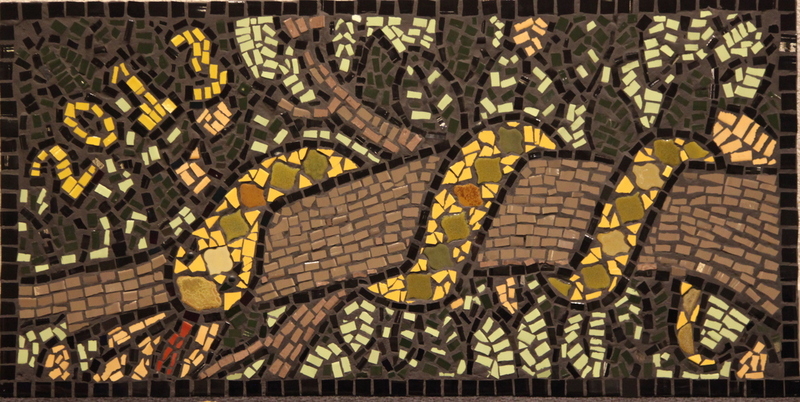 Sasini and Jamie Rose were the designers of this year’s mosaic for the Chinese Year of the Snake. We used Sasini’s snake on Jamie-Rose’s leafy background. Pictured in the photograph are Art Teachers Glenys Vella and Yvonne Osborn, Principal Chris Sevior, Sasini ( in blue) and Jamie-Rose. Our sincere congratulations go to both girls and to all the Grade Six students for their help in completing this year’s mosaic. This is the ninth in a series of 12 which began in 2015 with the Year of the Rooster. They are displayed on our school’s courtyard walls. Erika Doria was the chosen designer for the 2010 Grade 6 Mosaic. Erika’s tiger came up well in the brightly coloured ceramic tiles and the finished work shone billiantly under the spotlights on Graduation night. It is pictured here with Erika (left) and Acting Principal Chris Sevior. BJ Bentley, our 2009 designer, looks on as our Principal, Mr Peter Reading accepts the 2009 Year of the Ox mosaic. This is the 5th in our series representing the years of the Chinese Calendar. 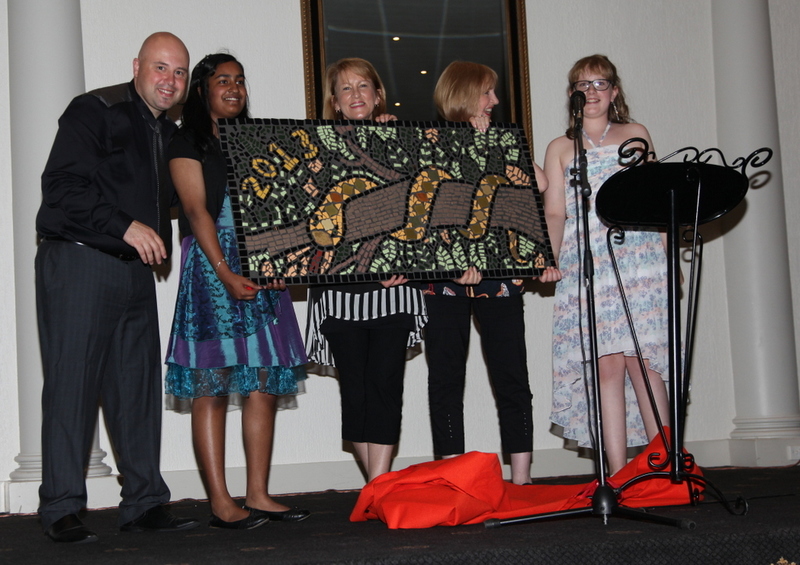 Our New Mosaic was presented to our Principal at Grade 6 Graduation on December 18th,2008. Our Mosaics have finally been displayed in our school courtyard. They are done each year as a Graduation Gift to the school. A student drawing is used as the basis of the design.The animals depict those used in the Chinese Calendar. 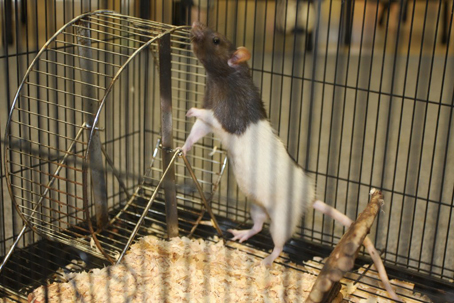 2008 is the Year of the Rat so we will work on that Mosaic in Term 4. 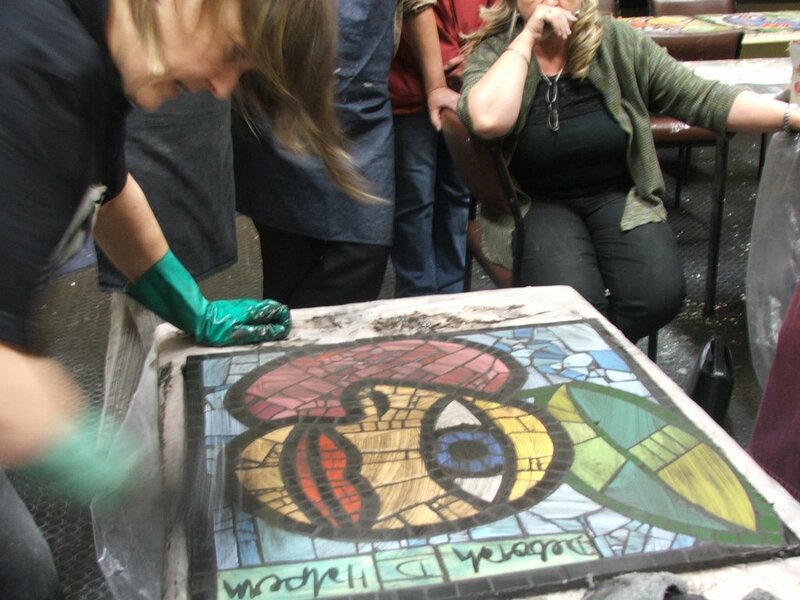 I have been fortunate to attend a 2 day workshop run by Mosaic Artist Deborah Halpern. 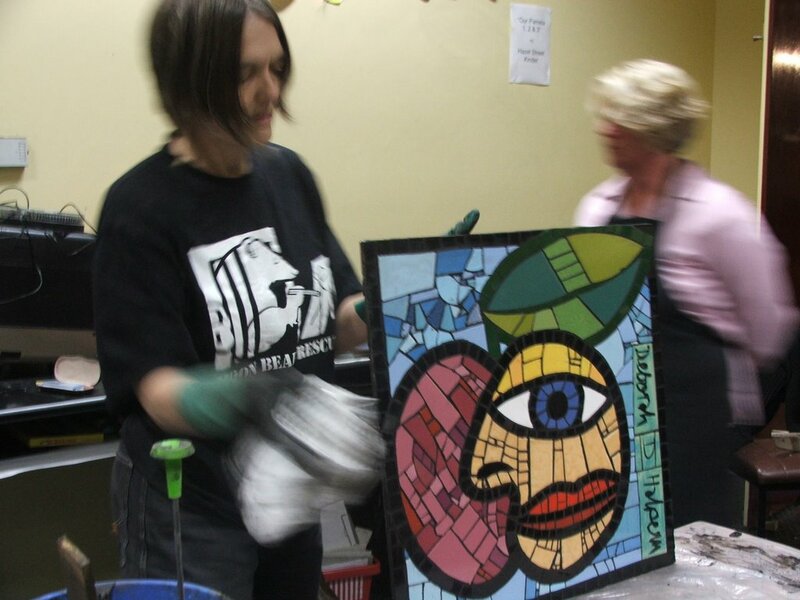 It was held at Ballarat Art Gallery in 2005.Below are 3 photos of Deborah’s work during the grouting process. 2010- This Year we will make a group mosaic of a Tiger. The Grade 6 students will all contribute during Fourth Term. We choose one of their Tiger drawings to use as the design and then we all cooperate to complete the work. The hard part will be finding orange tiles. 2009 – This year we are adding to our Mosaic collection with a mosiac of an Ox. Sketched by Grade 6 student BJ or Beaujess the Ox is well underway. 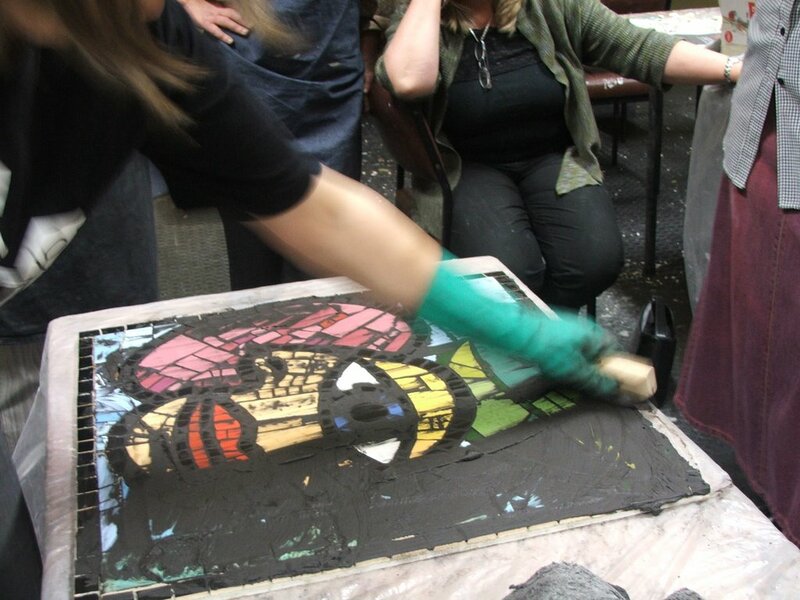 Students take a break from their own mosaic work and place a few tiles making it a group piece to be presented to the school Principal at Graduation on December 17th 2009. 17th July 2008.- We heard the sad news today that Munchkin died a few weeks ago. We were fortunate to meet, admire and draw her earlier this year. 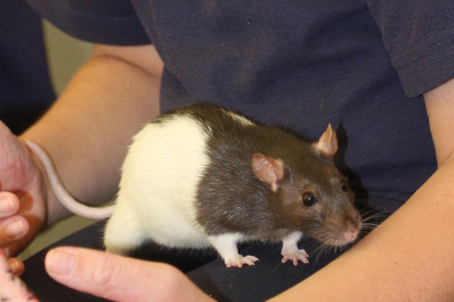 Later in the year we will make a rat mosaic and dedicate it to her memory. RIP Munchkin. corresponds with the Chinese Calendar for that year. 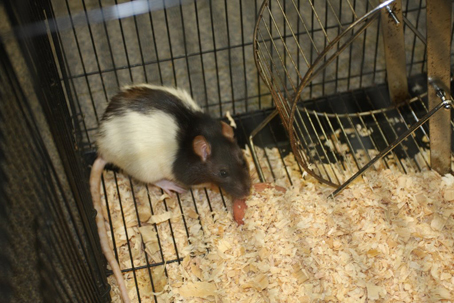 This year, being the Year of the Rat, we were visited in the ArtRoom by pet rat, Munchkin. We watched her closely and have prepared some drawings in preparation for our Mosaic later in the year. Each year the Grade 6 students at Taylors Lakes create a mosaic featuring the animal which corresponds with the Chinese Calendar.This year, being the Year of the Rat. 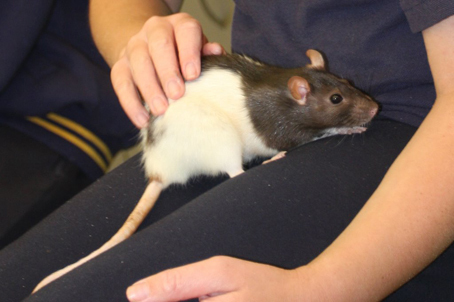 we were visited in the Art Room by a pet rat, Munchkin, so we could draw her in preparation for our mosaic. Cool pictures ill like to look at more. There is a lot of effort put into the mosaics and i can see the tiger very clearly. Erica we all like your design. Everyone enjoyed making the mosaics. It looks stunning now. Great job grade sixes!!!!!!!!!!!!!!!! It was very kind of you to comment on Erica’s Tiger Mosaic design. The Mosaic will be unveiled at Graduation tomorrow night. Thx Ms.Osborne! 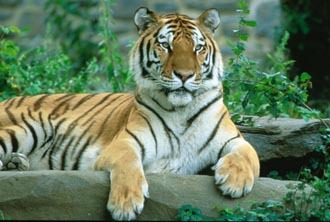 I loved graduation and I also saved the picture of the tiger mosaic. I’m glad you liked Graduation and the Tiger Mosaic picture. Our Gardener, Mr Jackson, put it up on the wall in our school courtyard yesterday so there are now 6 mosaics in a row, beginning in 2005 with the Year of the Rooster. I am pleased that you are making comments on our Visual Arts Blog. I am trying to encourage all our students to make blog comments. There are many wonderful Class Blogs out there all over the World and they deserve recognition. See u next year and I will be coming around telling about High school. hope u r having a great holiday. im am sitting in india and typing this post right now and i am looking at the stunning designs and all the artwork published after graduation night and they are fantastic. im really missing primary school and the weekly art lessons with mrs. osbourne. i will come back to visit for sure! I think the pictures look AWESOME. I hope you don’t have a really hard time to choose who is having their design for the mosaics this year! It has been hard choosing from the designs. Thank you for putting so much effort into yours. I particularly like your leafy background. I will let you all know what the panel decides as soon as possible. Very Best Wishes form Mrs. Osborn. It’s Isabelle here from 6LM. Can’t wait to make the Year of the Horse next term. I looked it up and found it was the Wood Horse. Not sure what to do for that but 2014’s Year 6’s are very creative, we’ll think of something!!!! You are so right, this year’s a Grade 6 students are wonderfully talented and creative. I look forward to seeing your idea for the Year of the Horse.